Wi-Fi adoption within the home is now pervasive, but application usage can vary. 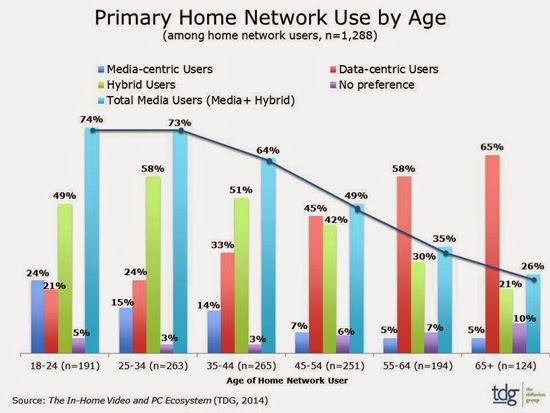 According to the latest market study by The Diffusion Group (TDG), 74 percent of Millennials that use a home network describe their use as either 'equally' or 'primarily' media-oriented, a rate that decreases linearly with increasing age. TDG’s detailed market assessment notes that this is coincidental with the fact that young adults consume greater amounts of digital media in the home from online video sources such as Netflix -- certainly more so than their older counterparts. While the percentage of digital media-oriented network users is relatively equal among the two Millennial segments, differences do exist. For example, among Late Millennials (18-24s), 24 percent are media-centric network users, significantly higher than Early Millennials (25-34s) at 15 percent. However, hybrid use (that is, equal use of the network for media and data purposes) was selected by 58 percent of Early Millennials compared with only 49 percent of Early Millennials. "Most interesting is how rapidly this media orientation drops off as the age of the home network user increases," noted Michael Greeson, president at TDG. "Beyond Millennials, this emphasis shifts incrementally toward a more data-driven behavior characterized by the use of net-connected, networked PCs for productivity or non-media needs." Various types of televisions in the broadband home, including their location by room and their rate of Internet connectivity. A variety of ancillary IP-enabled video platforms, including Blu-ray players, DVRs, game consoles, Internet set-top boxes, and Internet sticks. Smart TVs, included location and connectivity rate. Home networks, as well as in-home router placement. This is the fourth year TDG has published a report specifically on the in-home video ecosystem. Their latest study continues that tradition, while acknowledging and measuring the growing use of IP-enabled platforms located throughout the home.